Manage your inventory leaving your shop open and continuing to sell. 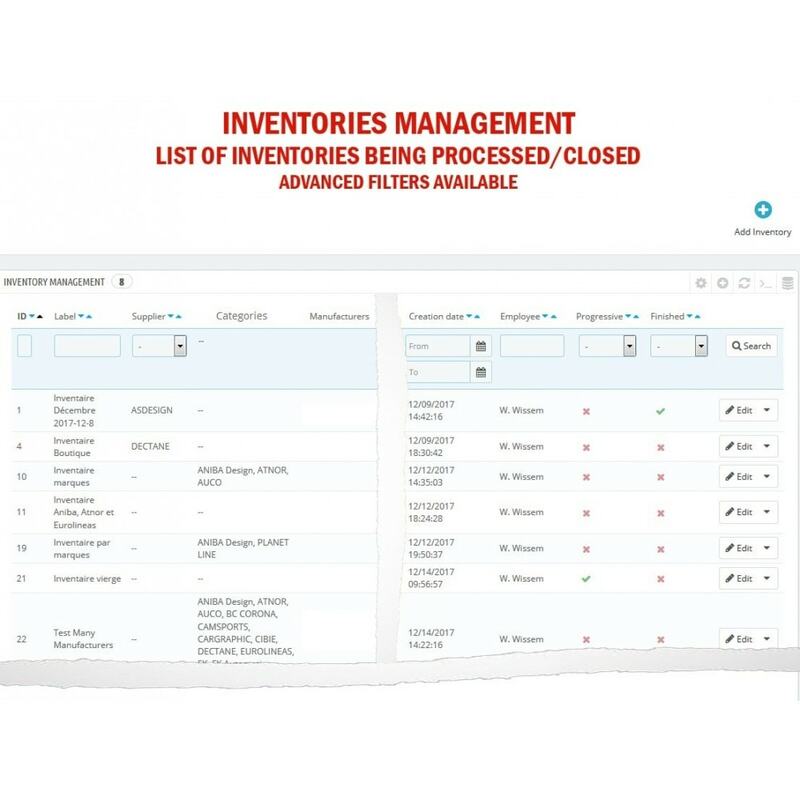 Save time by performing multiple inventories of products quantities. A barcode reader (shower) can be used to scan EAN/Reference in our search bar allowing saving time writing codes. 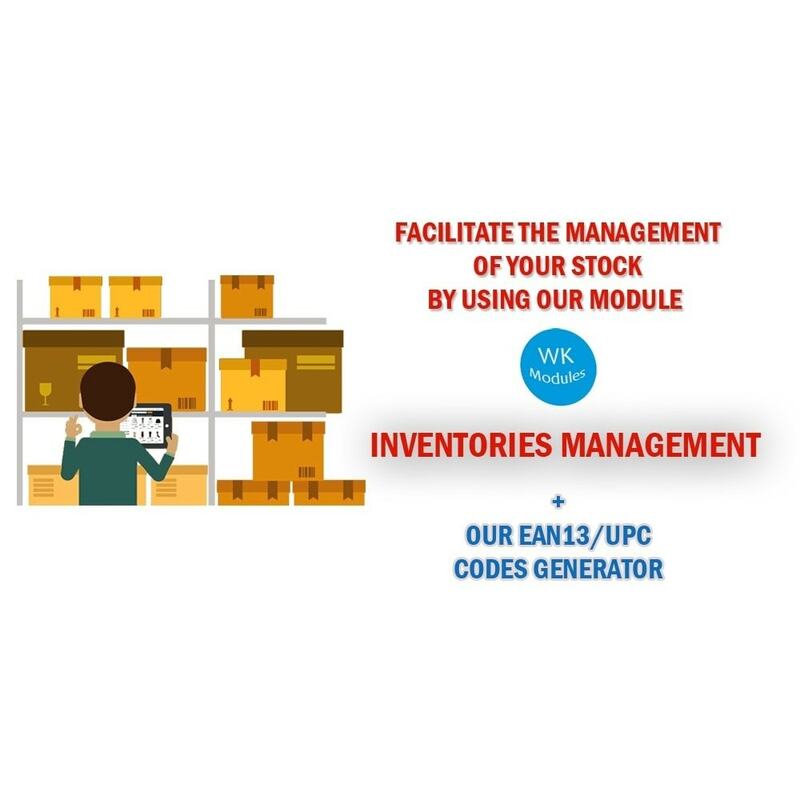 Generate quickly valid EAN/UPC codes for your products (compatible with marketplace) to facilitate the stock management. Increase the visibility of your products on a marketplace. Support for the new concept of managing stocks for Prestashop 1.7.2 and greater. Finally, this module is a must-have for your stock management, as it provides easy to know if they are accurate and thus better replenishes you to avoid unexpected out of stock! - you can create at the beginning an empty inventory and then add gradually products/combinations. A summary table allows you to have a view of the products to inventory. Correct (increase/decrease) and change for each product/combination its final and real quantity in stock. You can see and control at one glance the available quantity (found in your backoffice), the real quantity (found in your store or warehouse) and the stock gap. The quantities corrections can be applied to all products in list to faciliate the management. 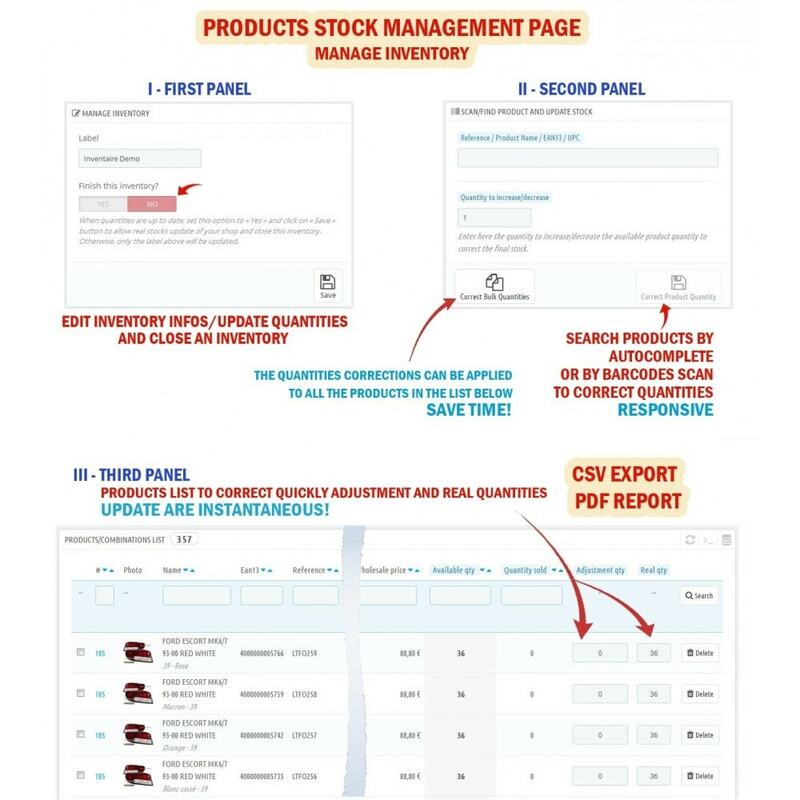 A search panel is available to facilitate searching for product/combination (manually with autocomplete search or by scanning barcodes) to inventory the stock. Take into consideration sold (reserved) quantities during managing inventories when there are new customers' orders. Once your products quantities are up to ­date, you can close inventory and update the real stocks in your shop. Support for the new concept of managing stocks for Prestashop 1.7.2 and greater (physical, reserved and available quantities). Export Inventoried products list to CSV file. Generate PDF report for Inventoried products. The barcodes generation supports a large number of products/combinations thanks to the Ajax technology. Responsive design and compatible with Smartphones (Convenient and useful when scanning EAN barcodes in your warehouses or stores, it's faster, so, no need to have your computer close to you). 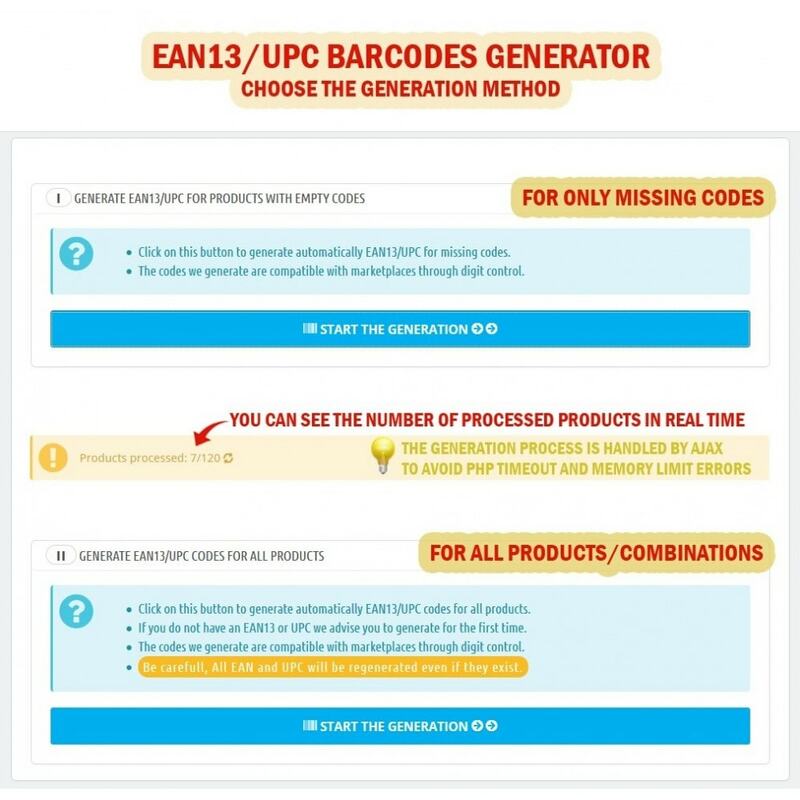 Options to enable letting generate and save automatically EAN13 / UPC codes after each product creation/update. Support for advanced stock management (For Prestashop 1.5 & 1.6). Multi-users (each employee manages his own inventories). Add support for advanced stock management (For Prestashop 1.5 & 1.6).